A couple of days ago, the teen popped outside to wait for a pizza delivery, which gave me a couple of minutes to write whilst she was not reading over my shoulder. Apparently, according to her, I am failing as a mother - again! We went to the supermarket to do a pre-Christmas essentials shop, she picked up one festive food stuff after another from a shelves, and each time I replied "Oh you don't need to buy that, I can make it". And so on, ad infinitum. She was trying it on a bit, she knew we had already made home-cured salmon and sloe vodka, that the gluten free pastry for the mince pies was mixed and waiting to be rolled from the fridge. However the cry went up when I saw her reach into a chiller cabinet for a huge premium-priced (but not delicious-looking) yule log. She knew she was pushing her luck, so we read the ingredients list together, and she put it back of her own accord. But did she moan! 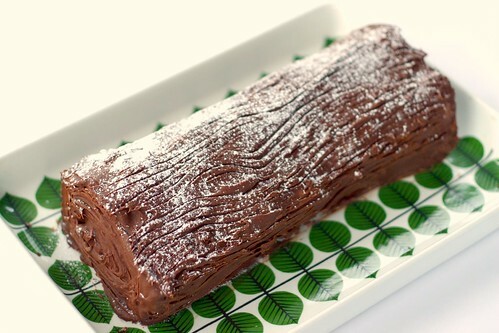 Chocolate logs are, I presume, historically an import from France where you find beautifully presented 'buche de noel' with marshmallow mushrooms in patisseries just before Christmas. 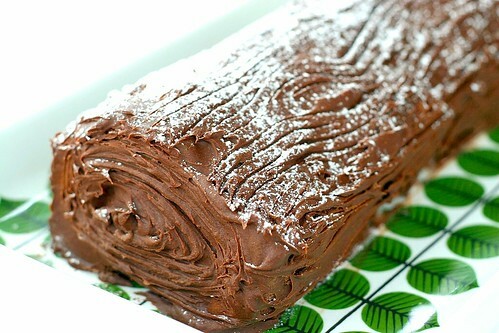 When we were kids, making a chocolate log was the only reason that we could persuade Mum to buy a supermarket Swiss roll, though we thought that they were the height of sophistication Mum was not convinced - imagine how excited we were when we later discovered Wall's Artic Rolls! So I can really understand the desire for a delicate rolled chocolate sponge filled with chocolatey buttercream with a bark-styled buttercream dusted in icing sugar snow. Anyway, whilst she is outside I will whisper to you that I've made this recipe, a gluten-free chocolate roulade and decorated it as a Chocolate Yule Log for our Christmas dinner. I want this to be a suprise for her as the teen is not a fan of Christmas pudding. For her, the main event will be a forerib roast with yorkshire puddings and all (yes, all!) the trimmings especially creamy horseradish. I am already looking forward to the look on her face when she sees it, even though she will probably be too stuffed to eat any till later in the day! I've used a Mary Berry recipe for the ingredients which is naturally gluten free. I am a great fan of Mary Berry and found that her foolproof recipes were a great way to build my confidence and learn the basics when I first starting baking cakes. Roulades look impressive but are not that tricky as long as you have a good recipe to start. For the yule log, I have used a different techinique from Mary Berry, in that I prefer to roll the sponge before it cools and unroll to fill before re-rolling. The key to making this is confidence. Believe that the sponge will be cooked enough even though it is only in the oven for 20 minutes. Be confident in rolling your sponge, and do it quickly before it can cool down and break. And gently unroll the cooled sponge to fill it before re-rolling. Knowing that I am going to cover the outside of the roll with buttercream icing means that I can patch up any cracks that I create as I roll, unroll and roll again. The Mary Berry method here suggests rolling the sponge once it is cold and filled. This is great if you don't want to make the roulade as soon as you have baked the sponge and especially good for summer roulades when you are decorating the dessert with little more than a sprinkling of sugar. Once you have made one and discovered just how straightforward they are, don't forget that this roulade recipe is a fantastic dessert for any time of year. Filled with cream or chocolate, cherries in summer or blackberries in the autumn (preferably without the chocolate buttercream 'bark') this is a lovely dessert for anytime of year! Add one spoon of the egg white mix to the chocolate mix and fold in. Peel off the backing paper from the sponge and roll up the warm sponge using the base sheet of baking paper, starting on one long side and working quickly but gently to create a roll - folding a long edge of paper over the sponge and then using the long edges of the paper to guide the roll, a bit as though you are rolling up a christmas cracker. Spread one third to one half of the chocolate cream filling on the sponge and re-roll quickly, don't worry if it breaks use the filling as glue to hold the bits together - you can cover up the damage afterwards with the chocolate cream coating! Spread the remainder of the chocolate cream over the outside of the roll and leave to set for 15 minutes. Using a fork, drag the prongs across the surface of the iced log to create the effect of tree bark, cover and chill in the fridge until you are ready to serve. Oh yum. This looks so much more professional than mine. I hadn't made a roulade since school days and although it all tasted delicious (used cream & pureed chestnuts as a filling), it didn't quite get the look I was hoping for. Don't think this is an easy one, but I will be trying it again for sure - and see if I can crack the rolling next time using your tip.